Working as America’s underdog upstart, Detroit continues to house successful businesses and industries demonstrating the ideal recovery story. 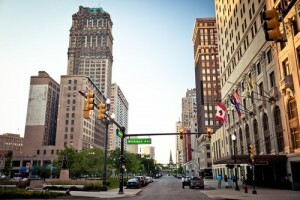 With Detroit being heavily impacted by the recession, there was much improvement needed to be done to the city. By organizations like Motor City Blight Busters, which helped revitalize the community by repairing neighborhoods and cleaning up the streets of Detroit, to the growing technological shift, which encourages more highly skilled professions such as engineering and IT jobs, this city has manage to bounce back and create a prosperous economy. Home to General Motors and Ford Motor Company (headquartered in a suburb of Detroit), the auto industry still is a pillar for Detroit’s economy. However, with companies now such as Duo Security and Detroit Labs, Detroit is one of the fastest growing regions for technology jobs in the country. According to the Detroit Regional Chamber, employment in the industry since 2009 has grown faster in Michigan and the Detroit Region than in the nation overall. Not only does Detroit provide a diverse range of jobs, but offers a wide variety of entertainment and culture. With the city’s famous nickname, Motown, live music has been an influential factor of Detroit’s nightlife since the late 1960s and continues to be as vibrant as before with music festivals and events throughout the year. Detroit Institute of Arts and Fisher Theatre along with other museums and entertainment venues contribute to the enriched culture. While many businesses call home to Detroit, universities all over Michigan contribute to the economic development in the Motor City and state as a whole. With many qualified graduates going into the workforce, Detroit encourages higher education to promote industry growth. Startups like Techtown Detroit and Are You Human have helped increased the opportunities for business in the city. In a report by Automation Alley, a technology business association and business accelerator focused on creating growth in Southeast Michigan, stated that the Motor City’s technology job development was up to the same standard with Silicon Valley. Working from the ground up, Detroit provides a great home for startups and businesses with a improved and growing economy. Find a Detroit area phone number for your business. To search numbers available in area code 313, click here.